There are two models of the SP50, the regular and the compact. The regular model takes a 6 cell battery pack (3 over 3) and the compact takes a 3 cell battery. The SP50 compact model only has 3 contacts on the side, whereas the regular model has all four (as shown on the programmer page). The top contact has been eliminated on the compact model, and the charger and programmer use the same contacts as the regular model. The parts list shows that most of the parts are interchangeable between the two models, differences arise in the battery area to accommodate the larger (or smaller) battery. The only tool required to take these radios apart is a prying tool like a flat screw driver. First, try using the shift key (as described on other pages) to enter the frequencies into the RSS. You may get lucky and not have to perform the procedure below. In the SP50.MDF file make a Checksum-16 of the whole file (the F12 option in Hex Workshop), in our case we ended up with 0x8C77 (RSS V 03.00), write this down, you might need it later. The highlighted area contains all the valid bandsplits that this particular RSS will recognize. Note there are 3 occurances of the strings DC 05 and A4 06, the first set is the limits displayed in the Radio Wide menu (F4-F2). The second set are the TX limits for the radio. The third set are the RX limits for the radio (note that if the TX and RX limits are not set the same the RX limits are screwed up). If you are using a calculator enter your limit (ie 1360 for 136.000 MHz) and convert it to hex, you should get 0x0550. When you enter the data into the .mdf file you have to reverse the bits such that you would actually enter 0x5005 in the field you are changing. You can then directly enter the hex result (0x5005) into the bandsplit field. In this example we are changing the lower bandsplit of a 150-170MHz radio to 136-170MHz. Locate the actual model number of your radio in the .mdf file. 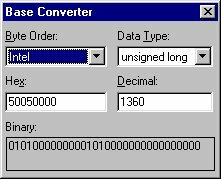 Copy down the three bytes prior to your model's name. Locate the model number of the radio that you want yours to become (i.e. g2__ instead of a2__ etc.). Copy down the three bytes before the name of this model. SWAP these two sets of numbers. 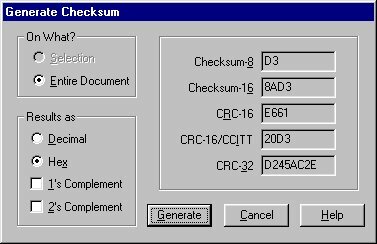 By doing this, you have not only made your model have all of the features of the other radio, but you have also preserved the all important MDF checksum! Note the highlighted bytes preceed the model you are trying to change. This modified software will now read your 2 ch radio as a 10 ch or whatever other model swaps you have done. You will of course want to save this hacked software in a separate directory and use it only to read your 2/10 channel radio because if you now read a factory 10 channel radio the last 8 channels will magically disappear because it now thinks it is the 2 channel one! All that is left to do is to stick on a 10 channel escutcheon and knob and you are ready to talk! Also note the 0x04 at offset 0x57C, this is the bandsplit identifier for this model number and corresponds with the entry in the bandsplit table at the top of the .mdf file.